Submitted photo Southern Ohio Correctional Facility (SOCF) staff spent hours creating and making flash cards to donate to local schools. SOCF donated over 160 packs of flash cards. Vern Riffe Students received several packs as part of this program. 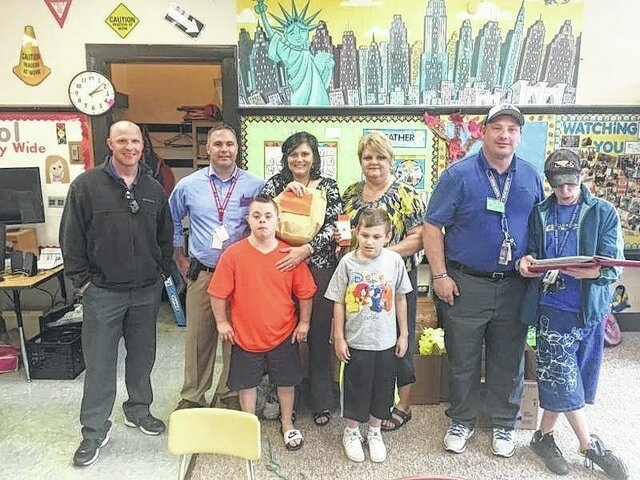 From, left to right, Jonathon Kearns, SOCF activity therapist; Brian Carter, SOCF activity therapy supervisor; Justin Sanford, VRS student; Julie Monroe, Scioto County Board of Developmental Disabilities superintendent; Michael Kirkendall, VRS Student, Dana Jones, VRS teacher; Eric Bailey, SOCF activity therapist and Jansen Riley, VRS student. The flash cards consisted of alphabetical prints as well as numerical prints that could be used in many different ways for educational purposes. For more information on opportunities available for individuals with developmental disabilities, visit on the web at www.sciotocountydd.org, like on Facebook at Scioto County Board of DD or follow on Twitter @SciotoDD. Southern Ohio Correctional Facility (SOCF) staff spent hours creating and making flash cards to donate to local schools. SOCF donated over 160 packs of flash cards. Vern Riffe Students received several packs as part of this program. From, left to right, Jonathon Kearns, SOCF activity therapist; Brian Carter, SOCF activity therapy supervisor; Justin Sanford, VRS student; Julie Monroe, Scioto County Board of Developmental Disabilities superintendent; Michael Kirkendall, VRS Student, Dana Jones, VRS teacher; Eric Bailey, SOCF activity therapist and Jansen Riley, VRS student. The flash cards consisted of alphabetical prints as well as numerical prints that could be used in many different ways for educational purposes. For more information on opportunities available for individuals with developmental disabilities, visit on the web at www.sciotocountydd.org, like on Facebook at Scioto County Board of DD or follow on Twitter @SciotoDD.